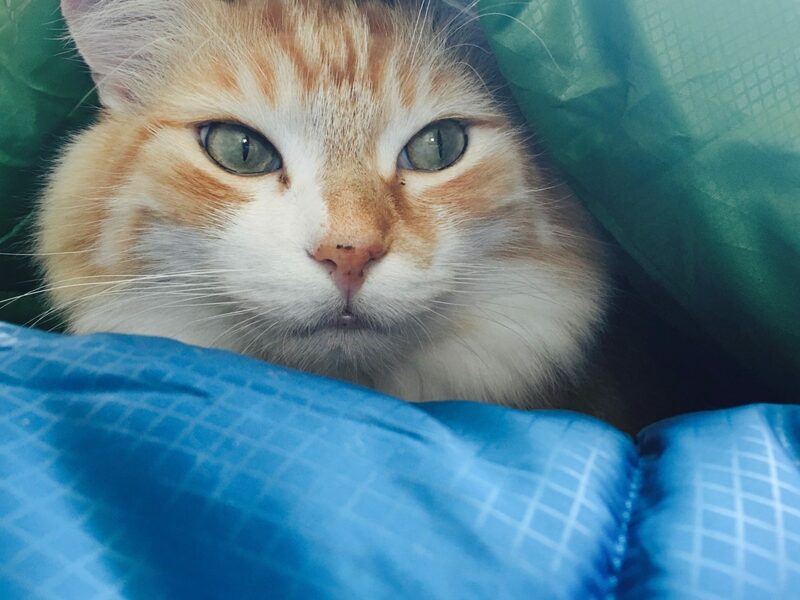 Our handsome ginger poses for your late-Caturday amusement, between new sleeping bags. The green is Annie’s—the Marmot Trestles 30, purchased during REI’s big sale a few weeks back. The blue arrived today, and rather quickly from The North Face. I ordered the Aleutian 20/-7 yesterday, expecting delivery in 5-7 days (free shipping). Maybe the company rushes for Father’s Day (tomorrow). Both bags are synthetic fill and fit individuals up to 1.67 meters (5 feet, 6 inches). I spread them out for comparison, which to Neko meant playtime. I captured the moment with iPhone 6s Plus, cropping out white from the sunlight door behind and applying the Chrome filter in Apple Photos. Vitals: f/2.2, ISO 40, 1/30 sec, 4.15mm.